Soak bamboo skewers in water to cover for 30 minutes. Meanwhile, cut chicken into 1-inch pieces; place in resealable food-storage plastic bag or container. Add teriyaki sauce; seal bag and shake gently to mix. Refrigerate at least 30 minutes to marinate. Heat gas or charcoal grill. Drain chicken, discarding marinade. 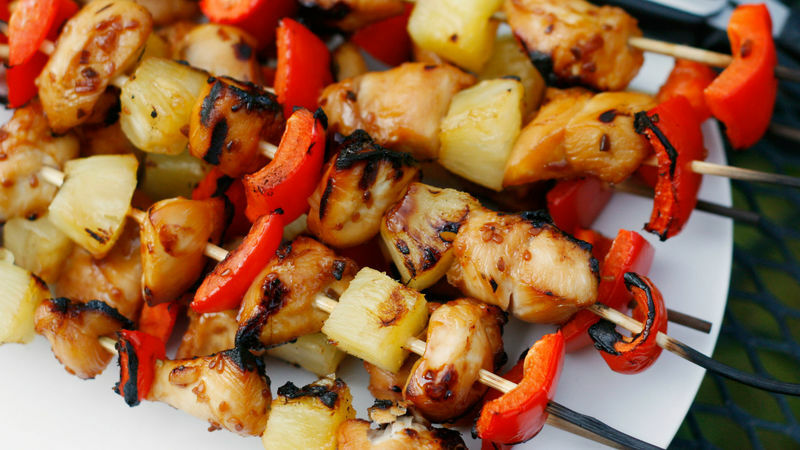 Thread chicken, pineapple chunks and red pepper pieces onto bamboo skewers in whatever order you wish, dividing evenly among skewers. Place kabobs on grill over medium heat. Cover grill; cook 4 to 5 minutes on each side or until chicken is no longer pink in center. Serve immediately. Chicken breasts can be substituted for the chicken tenders, if desired. If you have time, marinate for 2 to 4 hours. This will give the chicken a deeper flavor.